Today marks the 16th anniversary of the first episode of Gilmore Girls, a beloved television show centered around a mother and daughter living in Stars Hollow, Connecticut. To celebrate the event, Netflix turned more than 200 coffeehouses nationwide into Luke’s Diners. Anyone familiar with the show knows that Luke’s was the heart of the town, and where fast-talking Lorelai Gilmore and her daughter, Rory, spent seemingly all of their time. The campaign is genius. It leverages nostalgia to create a cultural and social experience that, most importantly, creates valuable buzz for Netflix’s November 25th premier of Gilmore Girls: A Year in the Life. The challenge was obvious, with so many quality TV show choices, how do you get people excited for the four-episode revival of a TV show that has been off the air for nearly ten years? The answer? Leverage social currency. Social currency is the perceived value gained from positive interactions with groups and communities. Nowadays, social currency often refers to an individual’s online influence and access to influencers, derived from their presence on social media platforms such as Facebook, Twitter, and Instagram. How does it make you look to talk about a product or idea? Most people would rather look happy than sad, rich than poor, and intelligent than stupid. Knowing about cool things—like Netflix turning the local coffeehouse into a Luke’s Diner—makes you seem sharp and in-the-know. I once asked a friend who was training for a marathon, “If you could not post anything online or tell anyone about running the marathon, would you do it?” Her honest answer, “probably not.” With social media, we’re able to brand ourselves however we want, and craft our own messages to achieve the desired impressions. 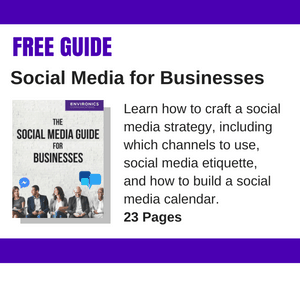 If your brand leverages social media, the concept of social currency needs to be a factor when developing your strategy. Creating shareable content boils down to understanding what triggers your audience into action. You can then understand exactly what makes them tick…or not. What elements create sharable content? Netflix created an environment where fans of the show could relive their youth and, most importantly, share their experience with others, increasing their social currency. When we care, we share. Personally, Gilmore Girls was a big part of my childhood. From middle school throughout high school I kept up with Lorelai and Rory. When I heard about 200 coffeehouses being transformed into Luke’s Diner, I immediately shared the story and looked up locations in DC. Sure, I could get a cup of coffee anywhere, but this was Luke’s! Netflix’s campaign played on my emotions, my nostalgia. And it worked. 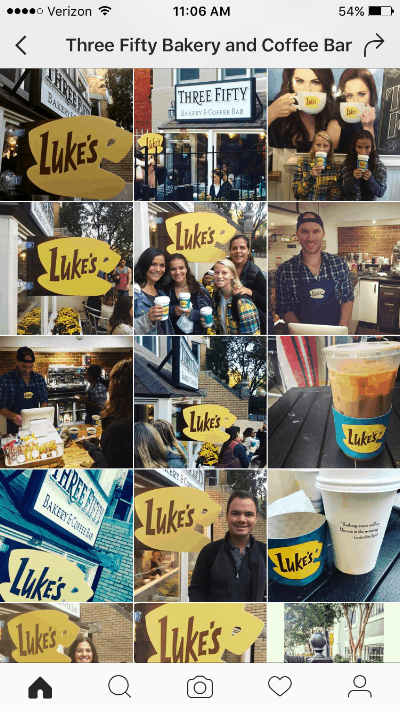 Each temporary Luke’s has decor from the show, such as Luke’s signs, Luke’s aprons, Luke’s backwards caps, and Luke’s coffee cups covered in Gilmore Girls quotes. The decorations themselves were promoted—and that is very important. People want to know if what they’re going to do looks cool. This increases the likelihood of social sharing, and thus, social currency. Thoughtful presentation of decor, drinks, and food is nothing new. However, what is new is how they’re conveyed through technology. Thanks to social media, everyone’s a photographer trying to impress others. Unfortunately, I couldn’t fit a walk down memory lane into my morning schedule—and after hearing about the hour-long lines at the pop-up coffeehouses, I’m glad I didn’t attempt it. However, when I looked at one of the location’s geo-tagged photos on Instagram, I wasn’t surprised by what I saw. Hundreds of posts featuring Luke’s coffee cups. People lined up as early as 6am to get a cup of coffee—and most importantly—share with their social network that they took part in the event. And, yes, I was jealous.